Dysmicoccus brevipes, commonly called the pineapple mealybug (Figure 1) or more specifically the pink pineapple mealybug, is a worldwide pest of pineapple crops and a minor pest of many other crops. Its importance as a crop pest of pineapple is tied strongly to its ability to transmit Pineapple mealybug wilt-associated virus to pineapples. Figure 1. 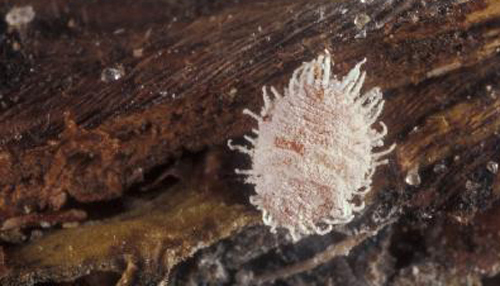 An adult pineapple mealybug, Dysmicoccus brevipes. Photograph by Lyle Buss, University of Florida. 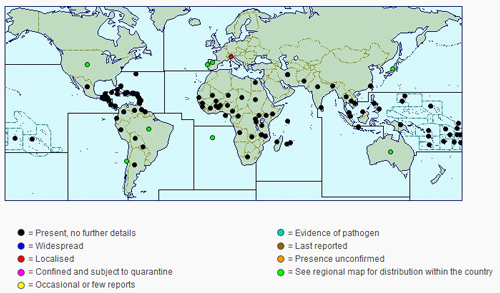 The pineapple mealybug is reported worldwide (Figure 2), and located anywhere pineapple is grown, including many African countries and Australia (CABI 2014, Beardsley 1993). It is believed to have originated in tropical areas in Central and South America (González-Hernández et al. 1999), and today has the highest density in areas considered tropic or subtropic. In the United States, it has been found in Florida, California, Louisiana, and all of the Hawaiian Islands. Figure 2. Distribution map of Dysmicoccus brevipes as of 2014. Figure from CABI, (CC BY-NC-SA 3.0). In early literature (sourced from the 1930s), it was thought that there were two strains of the pineapple mealybug and one species, named Pseudococcus brevipes. The pink and gray strains were found primarily on different structures of the pineapple plant, and reproduced using different methods. The pink strain reproduced parthenogenetically, while the gray strain reproduced sexually. In 1959, Beardsley demonstrated that the pink and gray strains were in fact different species. By this time the genus had been changed to Dysmicoccus, and Beardsley renamed the gray strain Dysmicoccus neobrevipes, the gray pineapple mealybug (Rohrbach et al. 1988) (Figure 3). Figure 3. A comparison of Dysmicoccus brevipes (left) to Dysmicoccus neobrevipes (right). Photograph from PaDIL, (CC BY 3.0 AU). Adult pineapple mealybugs are very small, about 1 mm wide, but are visible to the naked eye. They appear fuzzy with white wax, with a pink or pink-orange hue underneath the wax. They are oval and appear humped. The ventral surface of the adult mealybug has 17 pairs of wax filaments along the edge. The pair at the posterior end of the insect is the longest (Anonymous 2007). If the pineapple mealybug species is not confirmed by an expert, it could be confused with the gray pineapple mealybug, Dysmicoccus neobrevipes (A. C. Hodges, personal communication). More recently, there has been concern over what appears to be a biparental form of the pineapple mealybug that occurs outside the Hawaiian Islands (Rohrbach et al. 1988). This form seems to be morphologically indistinct from the pineapple mealybug, but reproduces sexually whereas the pineapple mealybug does not. In some reports it is considered to be a third species, while in others it is a sexual form of the normally asexual pineapple mealybug. In this article we will be focusing on the parthenogenetic species described by Cockerell. The pineapple mealybug forms colonies on the lower stem and roots of pineapple plants, just above ground level. They are less commonly found feeding on the leaves, fruit, and blossom cups. The pineapple mealybug is more reclusive than the gray pineapple mealybug, which feeds and resides on the aboveground portions of the plant (Mau and Kessing 2007). Adult females of the pineapple mealybug reproduce parthenogenetically, meaning no males fertilize the eggs. Every egg results in a female mealybug. The species is also ovoviviparous, meaning the eggs hatch within the adult female and she births live, fully-formed larvae. The average lifespan of the pineapple mealybug is 95 days, but ranges from 78 to 111 days (Mau and Kessing 2007). Like many scale insects, the pineapple mealybug is often tended to by ants, which harvest their honeydew as food. In return, the ants herd and protect the insects, even occasionally carrying the pineapple mealybugs to new host plants (Jahn and Beardsley 2000). The primary symbiotic ant species associated with the pineapple mealybug is Pheidole megacephala, commonly known as the bigheaded ant (Petty and Tustin 1993) (Figure 4). In Hawaii, these species are dependent upon each other. Other ant species associated with the pineapple mealybug include Iridomyrmex humilis, Solenopsis geminata, Ochetellus glaber, and others depending on the environment and geography (Rohrbach et al. 1988). Figure 4. 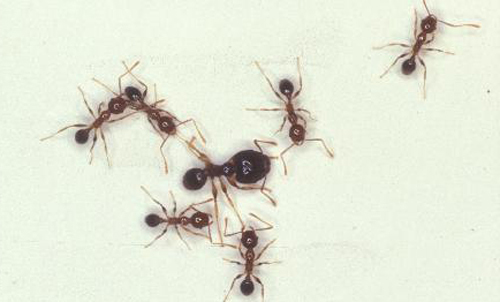 A major Pheidole megacephala worker (center) and several minor workers. Photograph by James. L. Castner, University of Florida. Eggs: The pineapple mealybug is ovoviviparous and keeps the eggs in her body (Pandey and Johnson 2007). Eggs, like the adults, are pink in color. The length of development time and other physical characteristics of this stage have not yet been studied. 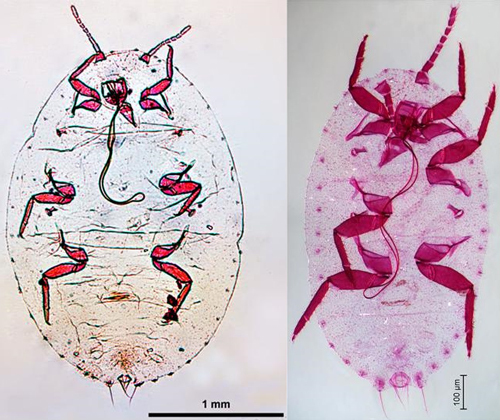 Nymphs: There are three nymphal instars for the pineapple mealybug, the first is called a crawler and is the primary dispersal stage of the insect. It feeds during the first and part of the second instar, and is primarily carried by wind to a new location. The nymphs resemble smaller adults, with white, flattened bodies covered in a waxy coating, with long wax filaments. The total time from nymph to adult is approximately 26 to 55 days, averaging 34 days. The first instar lasts 10 to 26 days, the second lasts 6 to 22 days, and the third lasts 7 to 24 days, depending on external temperature (Mau and Kessing 2007). Adults: Adults are female only, and have a half-sphere body shape. They are pinkish or pink-orange in color, covered in a thick layer of white wax. Identifying the pink pineapple mealybug female from the gray pineapple mealybug female requires microscopic examination and identification of distinguishing features (Anonymous 2007). The adult stage lives between 31 to 80 days, averaging 65 days. She has a period of prelarviposition, before she gives birth to young, lasting approximately 27 days. The adult then gives birth periodically about every 25 days, averaging about 250 young, but this number can be up to 1,000. After she finishes giving birth, she will live approximately five more days before dying (Mau and Kessing 2007). As the common name suggests, the pineapple mealybug is primarily a pest of pineapple, although it does not depend on that single host plant to complete its life cycle. Due to its polyphagous nature, the pineapple mealybug has been reported on more than 100 plant genera in 53 families (Ben-Dov). This insect is a minor pest on other bromeliads and a wide range of other plants including, but not limited to, Annona, avocado, banana, carrot, celery, Citrus, cocoa, coconut, coffee, cotton, Euphorbia, ginger, Gliricidia, Hibiscus, mulberry, orchid pineapple, taro, pumpkin, and many perennial grasses (CABI 2014). The pineapple mealybug damages pineapple in several ways, all of which lower the market value of the fruit. Direct feeding damages the fruit, causing chlorotic areas (areas that cannot produce enough chlorophyll), rotted bottoms, and mealybug stripe (streaks of discoloration with underlying tissue collapse). Feeding by the pineapple mealybug can weaken the plant, increasing susceptibility to other pests and diseases. Black spot, caused by a fungus, is reported on pineapple fed upon by mealybugs. Black sooty mold and other molds commonly grow in areas exposed to a buildup of honeydew produced by mealybugs. The highest concern for pineapple growers is the pineapple mealybug often vectors Pineapple mealybug wilt-associated virus commonly referred to as pineapple wilt, mealybug wilt, or edge-wilt (Sether et al. 1998) (Figure 5). Figure 5. A farmer in Ghana holds up a pineapple plant infected with Pineapple mealybug wilt-associated virus. Photograph by Jennifer L. Gillett-Kaufman, University of Florida. Pineapple wilt causes a reddening of leaves and a subsequent pink coloration. The plant loses rigidity and appears wilted. These symptoms may occur rapidly or slowly. The disease primarily attacks the roots of the plant, which in part causes the discoloration and leaf symptoms. Often times, the plants recover and continue growing, but will have reduced weight, leaf size, and root length. (CABI 2014, Mau and Kessing 2007). In crops where the pineapple mealybug is a minor pest, such as in coffee, they may cause an overall weakening of the plant due to feeding. This can result in stunted growth and lower yields (Mau and Kessing 2007). Biological Control: The pineapple mealybug has many natural enemies, both parasites and predators. Several have been established in Hawaii to control the pest on pineapple. These include parasitoids in the family Encyrtidae, Anagyrus ananatis, Euryrhopalus propinquus, and Hambeltonia pseudococcina, and predators in the family Coccinellidae, Nephus bilucenarius and Scymnus uncinatus (Jahn and Beardsley 2000). In a publication by González-Hernández et al. (1999), the same species were found attacking the pineapple mealybug in Hawaii, with the addition of the predators Lobodiplosis pseudococci (Cecidomyiidae) and Sticholotis ruficeps (Coccinellidae). Biological control efforts were mostly stopped post-World War II with the development of broad-application insecticides (Rohrbach et al. 1988). There are many more natural enemies of the pineapple mealybug for other crops where they are generally considered a minor pest. Biological control is much less effective when ants tend to the pest because the ants will actively defend the pineapple mealybug from harm (Phillips 1934). There are, so far, no good biological controls for ants tending pineapple mealybug, as the major predators of these ants are other ant species that drive the former out of the field (Rohrbach et al. 1988). Mechanical/Physical/Cultural Control: According to Ullman et al. (1993), heat treating the pineapple crowns in a water bath at 50°C for 30 minutes rendered them free of Pineapple mealybug wilt-associated virus and made the crowns less desirable for pineapple mealybug colonization. The most successful control of the pineapple mealybug thus far has been through control of the ant populations that tend to the pest. Without the care of ants, the pineapple mealybug becomes much more susceptible to predators and parasitoids, and the effectiveness of biological control increases. Ant bait traps and other ground traps have also been effective. Figure 6. A pineapple field in Ghana with several plants showing symptoms of Pineapple mealybug wilt-associated virus. Photograph by Jennifer L. Gillett-Kaufman, University of Florida. It is recommended that crops infested with pineapple mealybug or Pineapple mealybug wilt-associated virus (Figure 6) be removed entirely from the field and burned. This includes all crop residue, followed by a field tilling. Mealybugs and ants can reside on many plants other than their preferred hosts, and weeds and other debris in and around the field will keep a population stable unless routinely cleared (Mau and Kessing 2007). Chemical Control: Chemicals approved for control of the ants that tend to mealybugs, such as ant baits, have been successful in controlling pineapple mealybug populations (Mau and Kessing 2007). Use only those pesticides approved for use in your area and always follow the directions and precautions on the label. Anonymous. 2014. Dysmicoccus brevipes (pineapple mealybug). Invasive Species Compendium, CABI. Beardsley JW. 1993. The pineapple mealybug complex; taxonomy, distribution, and host relationships. Acta Horticulturae 334: 383-386. Ben-Dov Y. 2014. ScaleNet, Dysmicoccus brevipes. http://www.sel.barc.usda.gov/catalogs/pseudoco/Dysmicoccusbrevipes.htm. Casuso N, Hodges A, Hodges G. In Press. A Resource for Pests and Diseases of Cultivated Palms. Florida Department of Agriculture and Consumer Service, Division of Plant Industry and Identification Technology Program, CPHST, PPQ, APHIS, USDA; Fort Collins, CO.
González-Hernández H, Reimer NJ, Johnson MW. 1999. Survey of the natural enemies of Dysmicoccus mealybugs on pineapple in Hawaii. Biocontrol 44: 47-58. Hill SD. 1983. Agricultural insect pests of the tropics and their control, 2nd ed. Cambridge University Press, New York, New York, USA. 760 pp. Jahn GC, Beardsley JW. 2000. Interactions of ants (Hymenoptera: Formicidae) and mealybugs (Homoptera: Pseudococcidae) on pineapple. Proceedings of the Hawaiian Entomological Society 34: 161-165. Le Pelley RH. 1968. Pests of coffee. Longmans, Green and Co Ltd, London, UK. 590 pp. Mau RFL, Kessing JLM. 2007. Dysmicoccus brevipes (Cockerell). The Crop Master Program, EXTension ENTOmology & UH-CTAHR Integrated Pest Management Program. Pandey RR, Johnson MW. 2007. Enhanced production of pink pineapple mealybug, Dysimococcus brevipes (Hemiptera: Psuedococcidae). Biocontrol Science and Technology 16(4): 389-401. Petty GJ, Tustin H. 1993. Ant (Pheidole megacephala F.)-mealybug (Dysmicoccus brevipes Ckll.) relationships in pineapples in South Africa. Acta Horticulturae 334: 378-395. Phillips JS. 1934. The biology and distribution of ants in Hawaiian pineapple fields. Experiment station of the Pineapple Producers Cooperative Association Bulletin 15: 1-57. Rohrbach KG, Beardsley JW, German TL, Reimer NJ, Sanford WG. 1988. Mealybug wilt, mealybugs, and ants on pineapple. Plant Disease 72(7): 558-565. ScaleNET. 2007. Species: Dysmicoccus brevipes (Cockerell). APHIS, USDA. Sether DM, Ullman DE, Hu JS. 1998. Transmission of Pineapple mealybug wilt-associated virus by two species of mealybug (Dysmicoccus spp.). Phytopathology 88(11): 1224-1230. Ullman DE, Williams DF, Fleisch H, Hu JS, Sether D, Gonsalves A. 1993. Heat treatment of pineapple: Subsequent growth and occurrence of mealybug wilt of pineapple. Acta Horticulturae 334: 407-410. Authors: Ashley A. Egelie and Jennifer L. Gillett-Kaufman, University of Florida, Entomology and Nematology Department. Photographs: Lyle Buss, James. L. Castner, and Jennifer L. Gillett-Kaufman, University of Florida, Entomology and Nematology Department; Figure from CABI.